Welcome to galisonlaw.com law blog. Our mission: to scour the universe for compelling stories in several related areas: DWI law, criminal law and and traffic law. Current changes in these laws offer broad interpretations, encompassing such recent news as the Leandra’s Law, and Jack Shea's law which eases restrictions on collecting blood in intoxication cases. We’ll write about industry news and legal trends, with a sprinkle of good old-fashioned gossip. We’ll link to the best coverage of law and lawyers from around the Web, report some news of our own and look to you for contributions. We heartily invite your comments, tips and insights. Along with my ruminations, this blog will include bits and bites from articles in the the New York Law Journal and Legal Newswires. Email me at david@galisonlaw.com. With the consequences of a larceny related conviction being so severe it is of utmost importance to retain an experienced criminal defense attorney who will fight to protect your rights. 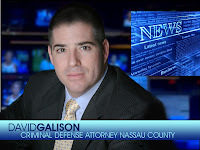 Whether it is taking your case to trial or negotiating a favorable plea bargain the law office of David Galison, P.C., will stand by your side throughout all stages of the case. Call the office today at 516-242-4477 for a Free Consultation. At the Law Office of David Galison, P.C., it is understood that an arrest and conviction for any crime can affect the rest of your life. With such serious consequences on the line, every client receives personalized attention. Clients are kept fully informed of their case's progress and actively participate in their defense throughout all stages of the proceedings. It is the personal service that David Galison, P.C. provides to the client that sets the office apart from other law firms.